So after my game on Saturday, I decided that I need to model up a Farseer on a jetbike as that seems to be a nice option. I have a bunch of old jetbikes that need to be refurbished, so I took the bike and cut off the wings on the back. 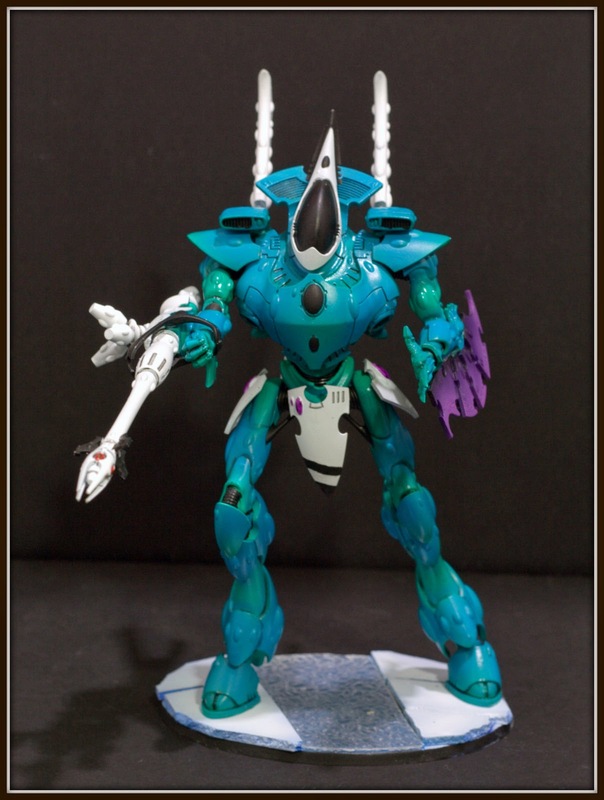 The body was taken from a guardian model (a female one at that), the head and right arm are from a Dire Avenger Exarch, the shield vein thing on the back is from the Wraithblades, and the wings on the bike are from the Crimson Hunter. Pretty happy with how it came out. If I were to do it again I would try and find another head that looks more farseerish as my conversion only looks alright. Played my game with Michael today. 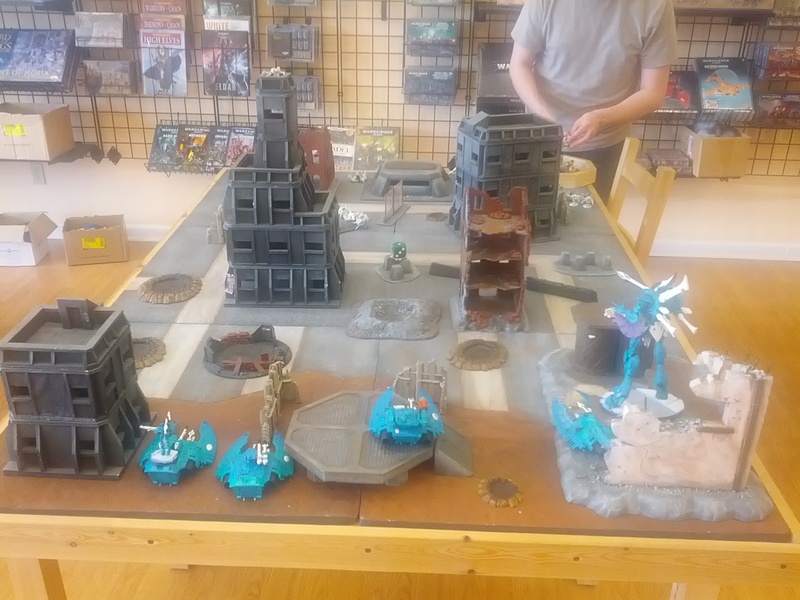 We played at a newer game store near his house Gameshire. It’s got some real nice tables and is well lit and clean. Seems like a friendly place to play. 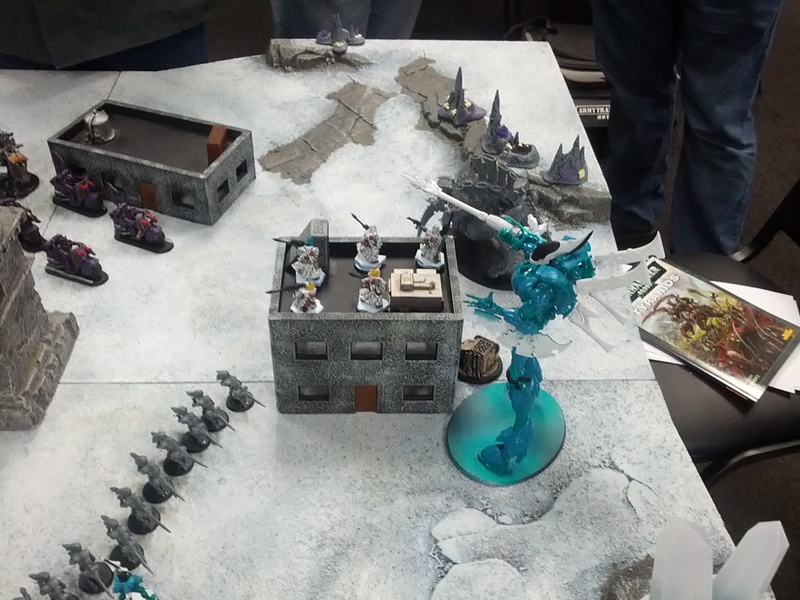 We ended up rolling mission 5, Elrdad’s Will and Hammer and Anvil deployment. He took first turn and hid most of his army. 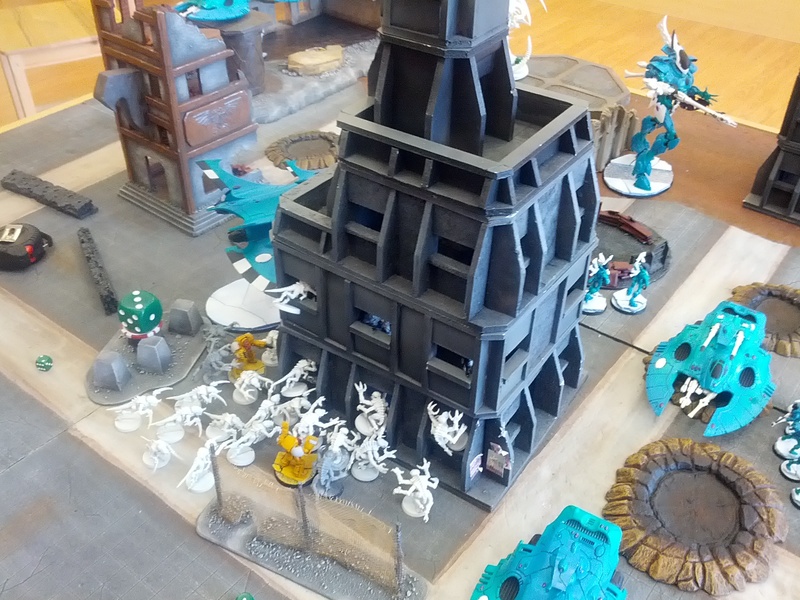 He was playing his Tyranids and didn’t have the tools to really take care of all of my skimmers. He really struggled to do much of anything the first few turns of the game, as he was scared to run his little bugs out into my fire lanes. 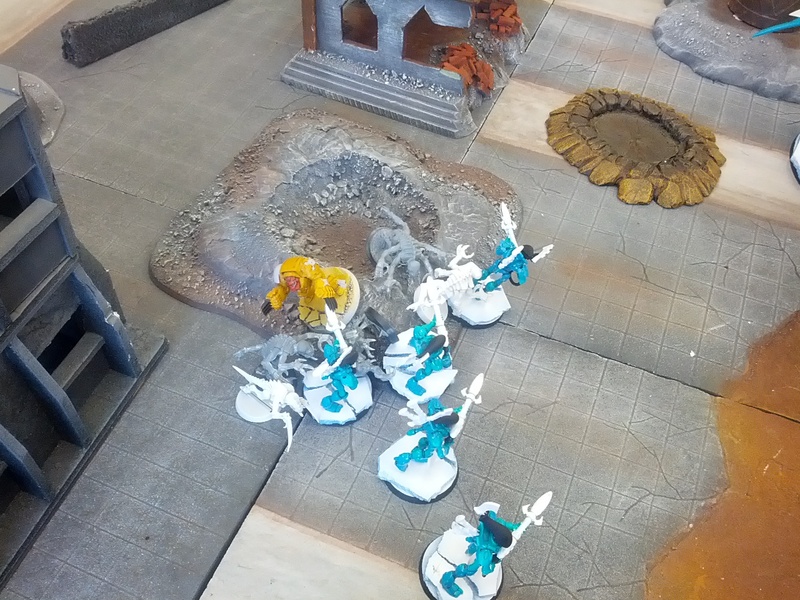 I managed to kill off a lot of his stuff by the end, leaving only a couple Genestealers, a single Hormogaunt and a couple Hive Guard at the end of turn 5. 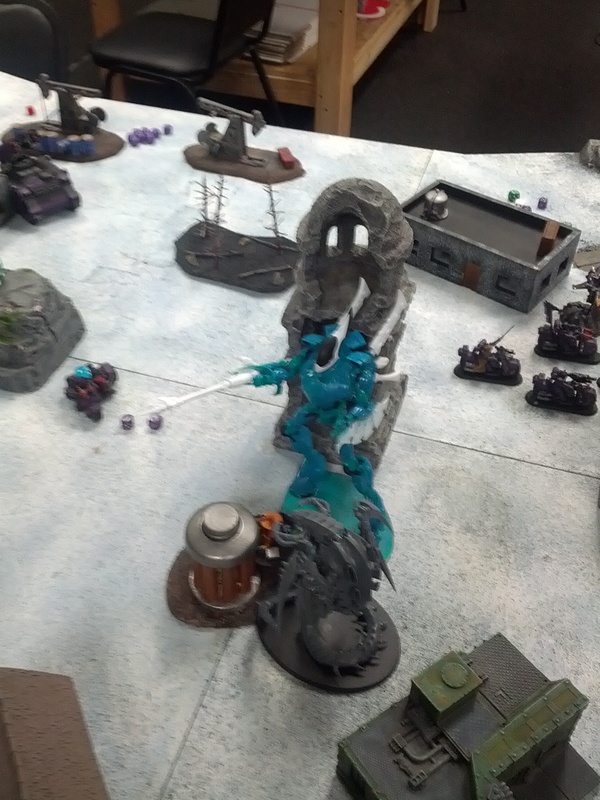 He did bring down two of my Wave Serpents, the Nightspinner, the Rangers, a squad of Dire Avengers and all but one Wraithguard (who would have died had we opted to continue on). 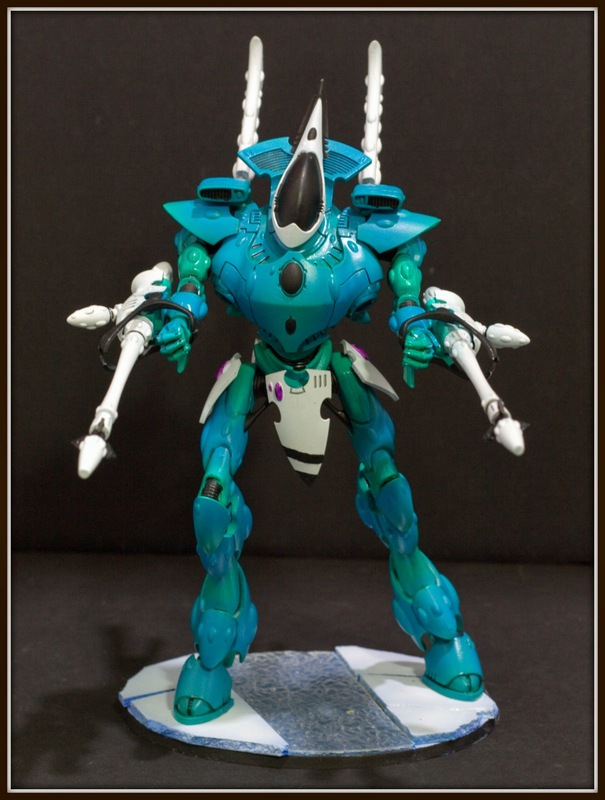 The stand out units of the game were definitely the Wave Serpents. Loading them out with Scatter Lasers and Shuriken Cannon is just disgusting the amount of firepower they put out. I managed to roll two 6’s for finding out how many shots the Serpent Shield would have and just managed to tear units apart, I think it’s probably the best transport in the game with how survivable, fast, and damaging it is. It’s kind of sad that it vastly overshoots the Falcon and doesn’t take up a slot being a dedicated transport. 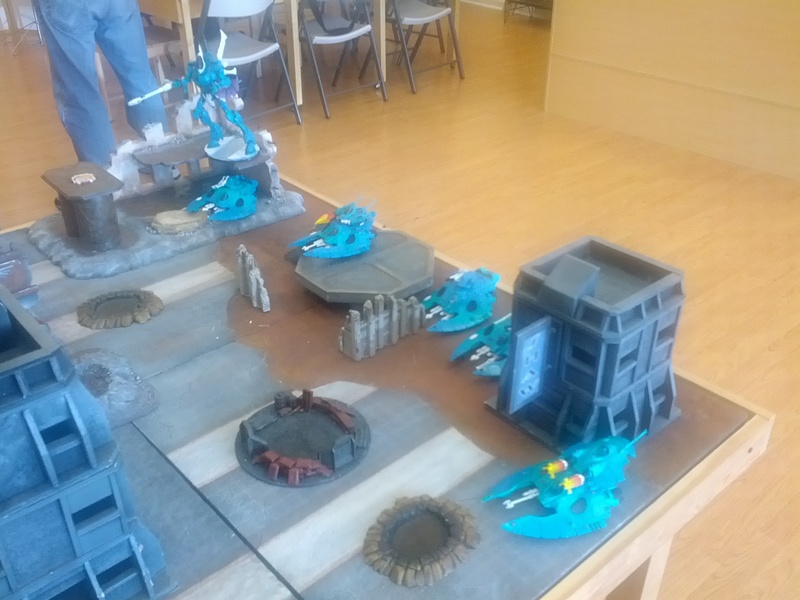 The jetbikes were also awesome, but only because they were able to turbo boost across the table and take his objective. I liked the Dire Avengers over the Guardians as I found that extra 6″ and the 4+ armor save really helped to keep them alive. 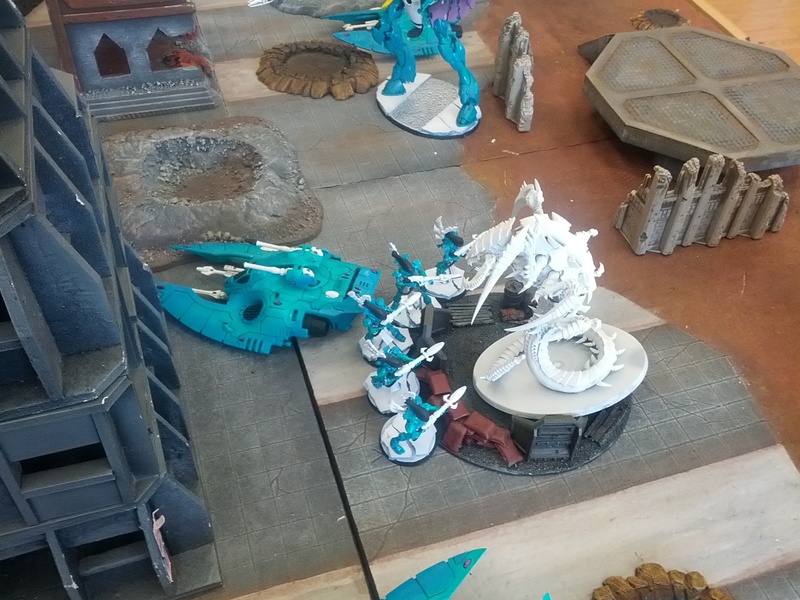 The Wraithguard with D-Sythes were also very nasty, instant killing a Mawloc, though they were brought down by Genestealers, but required a multi-assault were one unit was all but wiped out on over-watch so the second could get into close combat. It was fun to play, but I did feel a little bad for the Tyranids, as they are really showing their age/bad codex writing. It doesn’t help that Michael doesn’t like Tervigon’s which seem to be the real useful unit in codex. 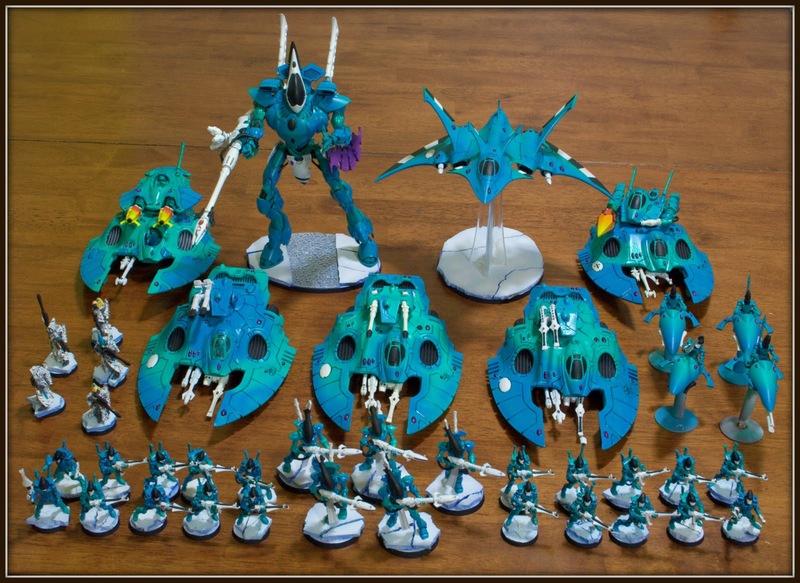 So this my army I’m taking to play a game with a friend tomorrow. I’m trying a few new things from last game. 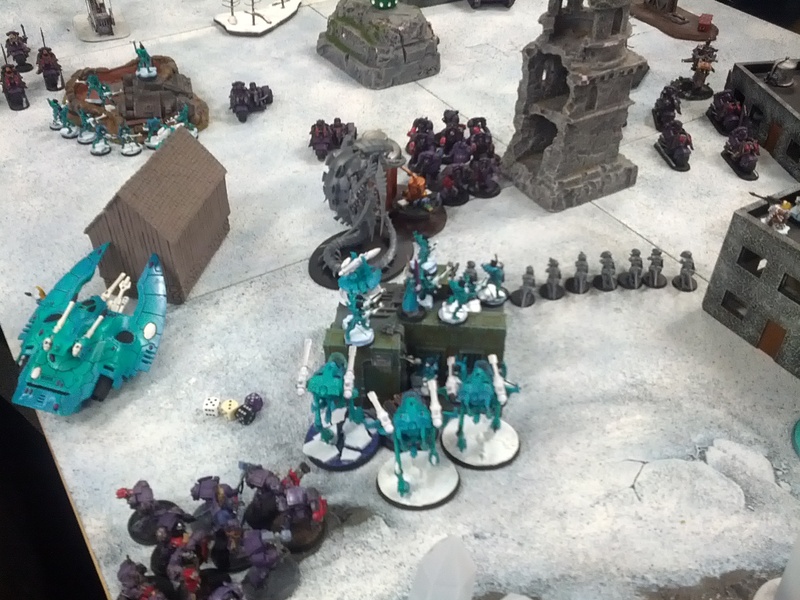 Mostly putting the troops into Wave Serpents to see if I can get them to last beyond the first turn. 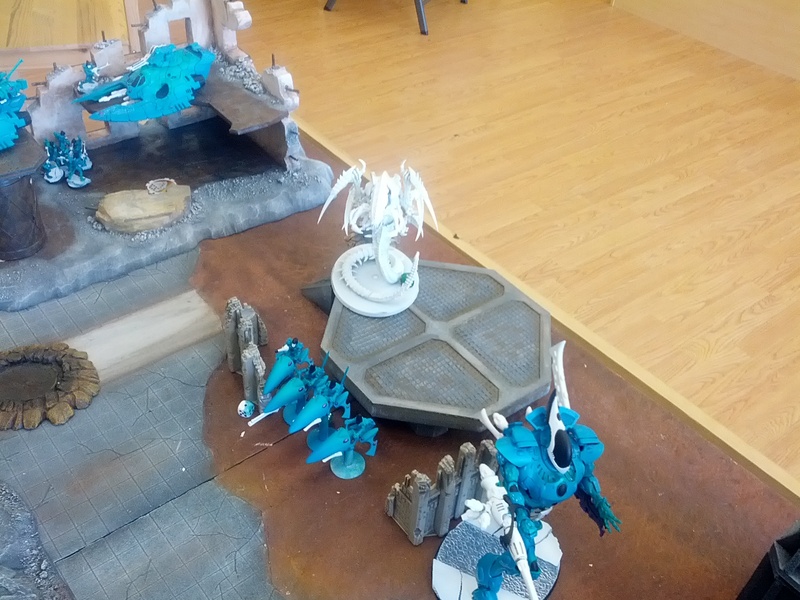 Also dropped the War Walkers to fit a Night Spinner and a unit of 5 Wraithguard with D-Scythes in a Wave Serpent. This is going to be my, don’t get anywhere near me or you die unit. I’m also playing the guardians as Dire Avengers to give me that extra bit of range, and the better 4+ save. I finished up two more Wave Serpents last night. I did a little conversion to side mount the turret weapons rather than have one on each side. They are also magnetized to switch out and I will make more of the options in the future. 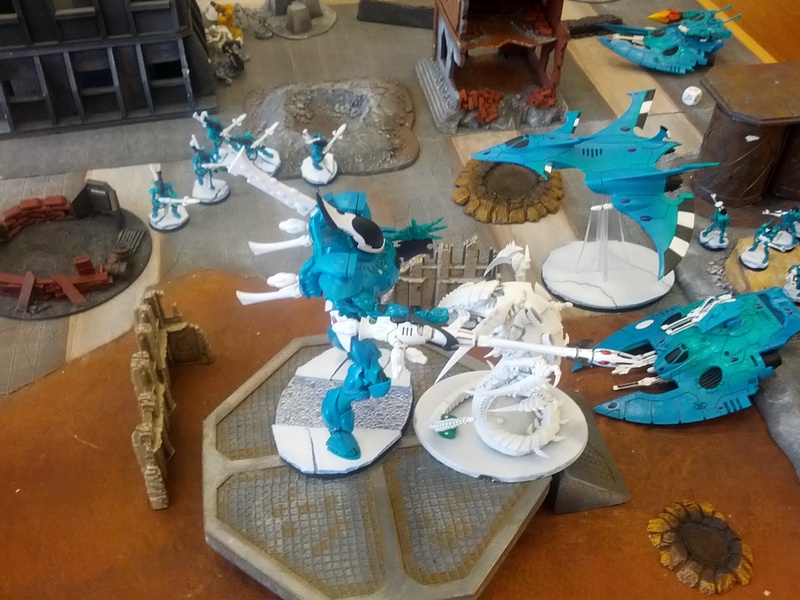 This gives me three painted Wave Serpents in total and I would like to convert one of my Falcon hulls as well as the Wave Serpents are really good in the new codex.